This is largely a matter of where you are commuting. If your journey is under five miles on nice flat roads, any well maintained bike will do. If you have a mountain bike a tyre change may be the only change needed. Road or hybrid bikes are pretty much perfect and would transport you swiftly and in reasonable comfort. Refer to the getting started pages for your options. For mixed-mode commuting, a folder is just the thing. 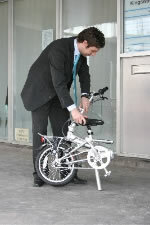 In fifteen seconds your bike transforms into a neat hand-portable package which you can carry onto the train. In every case you are better off with a good quality second hand bike than a cheap new one. Cheap bikes are a menace: their frames are heavy and lumpen. A second-hand bike might need the occasional new component (and you can upgrade them all you like!) but if the frame is heavy the bike is heavy, and there’s nothing you can do about it. 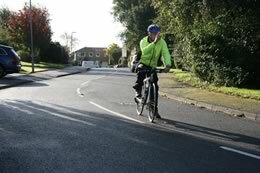 Watch out for people cycling along your route – see what kinds of bikes they ride. Ask them about their bikes. Some mudgaurds would be useful and some good lights for the winter are pretty essential. The government are offering tax incentives for employers, your company may have a scheme or you may be able to persuade them to join.